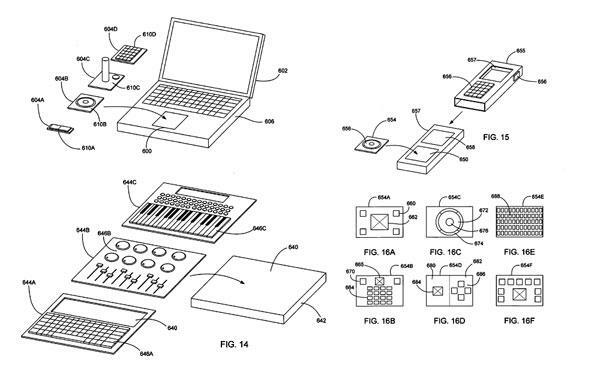 Inside its Cupertino, Calif.-based design labs, Apple Computer has been developing a multipurpose touch interface, similar to a track pad, on top of which users could place several alternative types of hot-swappable mechanical control interfaces, a recent patent filing has revealed. 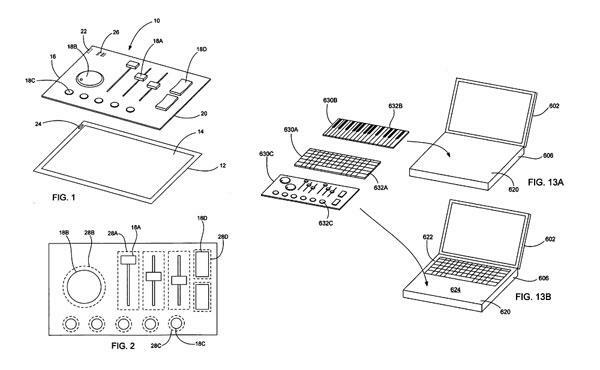 The May 12, 2005 filing, published for the first time by the United States Patent and Trademark Office on Thursday, describes "mechanical overlays," which may include one or more "mechanical actuators" that provide touch inputs to a touch sensing pad. In layman's terms, a "mechanical overlay" can be an audio equalizer, musical keyboard, or video game controller, with the "mechanical actuators" representing individual components of the overlay, such as buttons, keys, sliders, dials, wheels, switches, or joysticks. Apple said in the filing that the underlying touch sensing device could be a touch pad that is built into a computing device such as a laptop computer or one affixed to a handheld PDA or digital media player. Similarly, the touch sensing device could also be a touch-screen built into a tablet PC or a standalone device such as a tablet-sized touch pad. "The touch sensing input device is capable of sensing the mechanical inputs provided by the mechanical overlay and causing the host computing device to respond to those inputs," Apple said. "The inputs of the mechanical overlay may be assignable or they may be configured for a particular application of the host computing device." In one example, the mechanical overlay could transform the touch sensing input device into a control console or panel with a particular set of fixed mechanical inputs associated with a particular application of the host computing device. "A user can have several different mechanical overlays, each one with controls for a specific application," the company said. "For example, the user may have one mechanical overlay for video editing, another one for sound editing, another one for gaming, another one for data entry, another one for navigation, etc." By way of Apple's invention, users would be able to "simply remove and insert a new mechanical overlay" depending on the their needs. "In essence, different overlays can be designed for different applications of the host computing system," the company said. A mechanical overlay could be attached or held against the touch sensing input device in a variety of different ways. Some example adhesives listed in the filing include clips, pins, tabs, snaps, latches, screws, adhesive, velcro, magnets, static attraction, or suction cups. "Other examples include grooves or slots located on the touch sensing input device or around the touch sensing input device for receiving the base and holding the mechanical overlay in position," Apple explained. "For example, the base may be slid underneath a bezel or snapped into a lip at the edge of the touch sensing input device." In designing each individual overlay, the company said manufacturers would be able to choose from a variety of materials including both flexible and rigid substances. "By way of example, the base may be formed from plastics, metals and rubber like materials," it explained. "The material is typically selected so as to provide tight control over the placement of the mechanical actuators relative to the touch sensitive surface. In the filing, Apple goes on to say that the touch sensing input device "may be based on sensing technologies including but not limited to capacitive sensing, resistive sensing, surface acoustic wave sensing, pressure sensing, optical sensing, and/or the like." The touch sensing device could be based on either single point sensing or multipoint sensing, according to the filing. In the case of multipoint, the device would have the ability to sense multiple points of contact and report the multiple touches to the host computing device, for instance, allowing the user to adjust several sliders on an audio equalizer simultaneously. The patent filing, simply title "mechanical overlay," is credited to Apple employee Brian Huppi of San Francisco, Calif.